Found everywhere throughout the body, Coenzyme Q10, or CoQ10 for short, is a vitamin like nutrient that plays the role of both an antioxidant and a cellular energizer. Given the scientific name Ubiquinone after its discovery in 1958, CoQ10 plays a key role in every single biological function of the body. More than 90% of the circulating CoQ10 in our body is present as Ubiquinol -- the “active” antioxidant form of Coenzyme Q10. Research has shown the Ubiquinol form of CoQ10 to be absorbed better than the Ubiquinone form. However, not ALL Ubiquinol is created equal. See below! 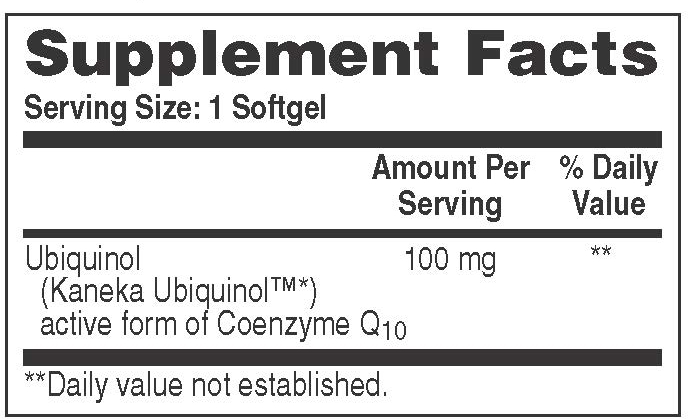 Why Choose Health Thru Nutrition Ubiquinol? 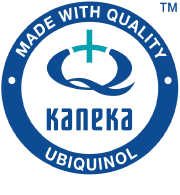 Our Non-GMO Health Thru Nutrition Ubiquinol features Kaneka Ubiquinol™. 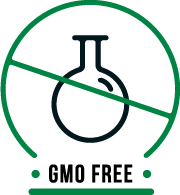 And, as with all of our products, it is manufactured in the USA under the most stringent cGMP standards. We use the same Ubiquinol derived from world’s most recognized and researched CoQ10 – the only all-natural yeast-fermented and bio-identical CoQ10 available. Research and exacting manufacturing standards make Health Thru Nutrition’s Ubiquinol one of the strongest lipid-soluble antioxidants available today. 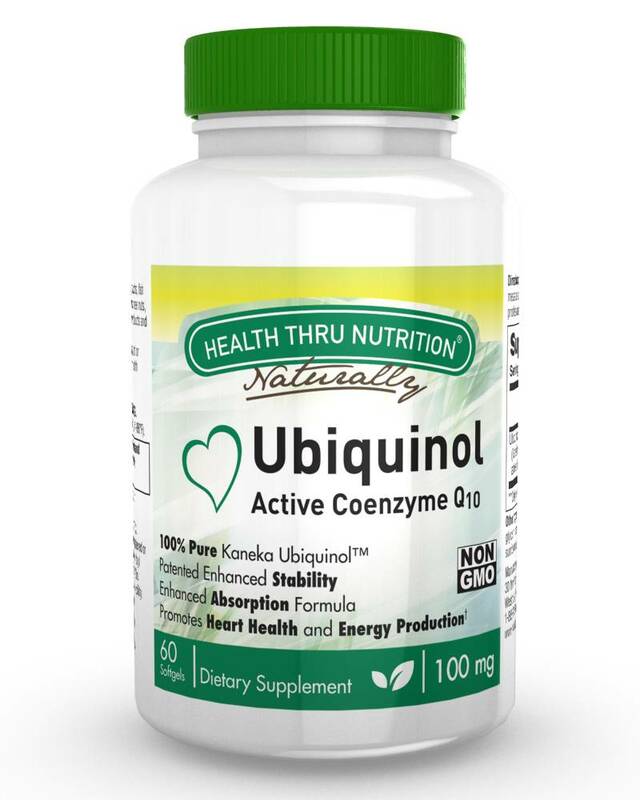 Best of all, Health Thru Nutrition’s Ubiquinol uses a PATENTED Enhanced Stability Formulation that guarantees you receive the Active Ubiquinol your body needs day in and day out. Other Ingredients: Medium chain triglycerides, gelatin, glycerin, ascorbyl palmitate, purified water, beeswax, sunflower lecthin and annatto suspension in sunflower oil. Directions: Adults: Take one (1) to two (2) softgels daily with meals as a dietary supplement or as recommended by your healthcare professional. Why is it added to the supplement? Annatto Suspension is a natural coloring pigment extracted from annatto seeds that is suspended in either soy or sunower oil. 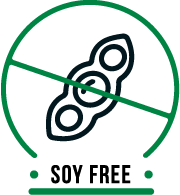 We use sunower to avoid the more common soy and any potential soy allergies that it may cause. This is the same ingredient that is used as a food-coloring agent found in margarine, dairy products and baked goods but obviously in much smaller amounts! Ascorbyl palmitate is an ester formed from ascorbic acid and palmitic acid creating a fat-soluble form of vitamin C. In addition to its use as a source of vitamin C, it is also used as an antioxidant food additive. Ascorbyl palmitate is present in very small amounts (or it would have to be listed in the active ingredients!). However, even in such small amounts, it is important in stabilizing the active ingredients, particularly Ubiquinol. There are NO allergens in this product. Is the capsule made from animal gelatin? Yes, these softgels are made with kosher & halal certified bovine (beef ) gelatin in order to ensure stability from the time of manufacture to the time they reach our customers. Why are they added to the supplement? Medium chain triglycerides (MCTs) are partially man-made fats, usually derived from coconut and/or palm kernel oils. Contrary to the notion that this ingredient may be bad for your health, medium chain triglyceride (MCT) consumption may, in fact, have a beneficial impact on weight management. Clinical trial results suggest that MCT oil can be incorporated into a weight loss program without fear of adversely affecting metabolic risk factors. While, the amount of MCT’s found in this product are too small to help in any weight loss regimen, it is just enough to help absorb the ubiquinol CoQ10 your body needs. Lecithin is a fat that is essential in the cells of the body. It is found naturally in many foods, including cauliflower, beans, most leafy veggies, egg yolks and soybeans. In this supplement it is used as an emulsifier / lubricant. 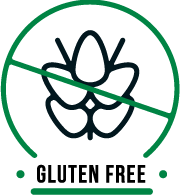 We use sunflower lecithin to avoid the more common soy lecithin and any potential soy allergies that it may cause.